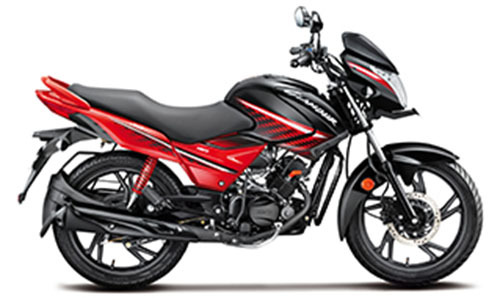 Hero Motocorp introduced the New Glamour 125 which is one of the top-selling motorcycles in India. 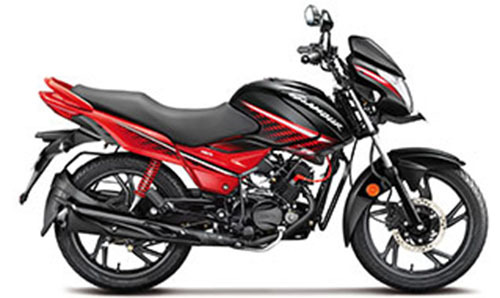 A marvel of a machine that boasts of muscular design, stylish graphics and a performance-packing 125 cc torque on demand engine for efficient mileage. Built to suit your riding style with modern features, it brings you better functionality, so you can always stand out and stay ahead. Best features for better convenience- – the LED Tail Lamps, Wider Rear Tyres, Digital Analog Meters and the Latest i3S System Idle Start Stop System that makes your ride more comfortable. Maximum engine power- 8.5 kW(11.4 bhp) 2 7500 RPM with Carburetor-CV Type fuel system and Fuel tank capacity up to 11 litres. High-Quality suspension to enhance the convenience level with the help of Telescopic Hydraulic Shock Absorbers at the front and 5 step Adjustable Hydraulic Shock Absorbers at the rear. 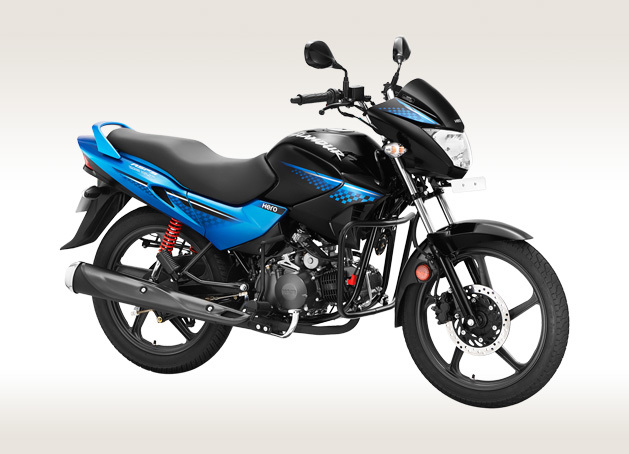 Hero Glamour has come up with its unique model variant Glamour Programmed FI 125 which is upgraded with HI-Tech technologies and features for better enhancement. The programmed FI system injects the right amount of fuel into the cylinder, calculated by the data received through Hi-Tech sensors. With Real Time Mileage Indicator and stunning graphics, this masterpiece is set to make heads turn on the streets. Let us now understand the different color variants for both New Hero Glamour and Glamour Programmed FI. Check out the New Hero Glamour motorcycle in the Black with Techno Blue Color variant which gives classy and distinct look among four 2018 New Hero Glamour Colors. Above is the photo of 2018 New Glamour in Black with Techno Blue Color Variant. 2018 Glamour is made available in Blue Color (Black with Techno Blue). Check out the New Hero Glamour motorcycle in the Black with Sports Red Color variant for the premium look and feel. Above is the photo of 2018 New Glamour in Black with Sports Red Color Variant. 2018 Glamour is made available in Black with Red Color (Black with Sports Red). Check out the New Hero Glamour motorcycle in the Candy Blazing Red Color variant for the premium look and feel. Above is the photo of 2018 New Glamour in Candy Blazing Red Color Variant. 2018 Glamour is made available in Red Color (Candy Blazing Red). Check out the New Hero Glamour motorcycle in the Black with Tornado Grey Metallic Color variant for the rusty and sporty look. Above is the photo of 2018 New Glamour in Black with Tornado Grey Metallic Color Variant. 2018 Glamour is made available in Grey Color (Black with Tornado Grey Metallic). The colors for New Glamour and Glamour Programmed FI almost remains same. But, Glamour programmed FI is a third-Gen technology embedded motorcycle for today’s world. Check out the New Glamour Programmed FI motorcycle in the Candy Blazing Red Color variant for its premium look and feel. Above is the photo of 2018 New Glamour in Candy Blazing Red Color Variant. 2018 Glamour is made available in Red Color (Candy Blazing Red). Check out the New Glamour Programmed FI motorcycle in the Techno Blue Color variant. Above is the photo of 2018 New Glamour in Techno Blue Color Variant. 2018 Glamour is made available in Blue Color (Techno Blue). Check out the New Glamour FI motorcycle in the Black with Sports Red Color variant for its premium look and feel. Above is the photo of 2018 New Glamour in Black with Sports Red Color Variant. 2018 Glamour is made available in Black with Red Color(Black with Sports Red). What’s your favorite Hero Glamour color option? Let us know by commenting below.